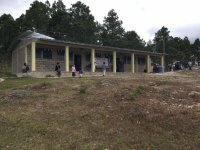 This school was built with money provided by the Government of Taiwan but was unable to open because it did not have the necessary equipment. CH Trust has been instrumental in providing this equipment and the school did finally manage to open in June 2014. Keith visited the school on the day when it was holding its special Christmas meal. ‘Hello, my name is Admer-Raul Almendarez and I am the Headteacher of the Ana Garcia Carias School. We are based here in El Macuelizo in the village of Cerrogrande in the district of Valle de Angeles, Honduras, Central America. Thank you CH Trust for the help that you have given us in 2014. Thanks to this we managed to open the School for the first time. 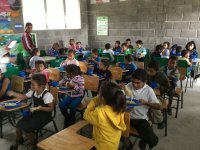 Previously we did not have any furniture and it was only in June 2014 that we received from CH Trust chairs, tables, whiteboards, educational materials, uniforms for the pupils and shoes (some of the children come to School barefoot). This has led to a great change in our circumstances because thanks to the organisation our School continues to grow. Last year we had a total of 60 pupils on our roll but this year, having seen how well the School is equipped thanks to the organisation, it looks like we will have approximately 100 pupils. Thanks to your support the School continues to grow and I give you my thanks as Headteacher and also on behalf of the parents. Also, today, we have a special lunch which consists of chicken with rice, fruit salad and a fruit juice to drink which has been provided by the organisation. 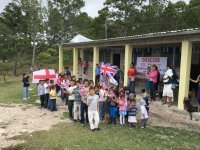 Many thanks and we would like to continue to receive your support because our village is very poor and the children come from many different places. Some even have to walk up to six kilometres but thanks to God we have our School and we are very grateful’.